Brussels (Belgium) – March 1, 2018 (travelindex.com) – Advancing sustainable tourism across Europe is at the centre of an agreement signed today between the World Tourism Organization (UNWTO) and the European Parliament. During his first official visit to Brussels (27-28 February), UNWTO Secretary-General, Zurab Pololikashvili, met with the President of the European Parliament, Antonio Tajani, the European Commissioner for Internal Market, Industry, Entrepreneurship and SMEs, Elżbieta Bieńkowska as well as the Vice-Chair of the Committee on Transport and Tourism and Responsible for the Tourism Task Force, Istvan Ujhelyi and the representatives of the European Tourism Manifesto. 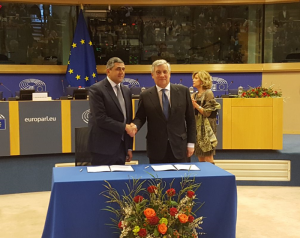 Addressing the Tourism Task Force of the European Parliament Mr. Pololikashvili highlighted the need to enhance integration, connectivity and technology to maximize the role of tourism in creating jobs and stimulating growth in the European Union (EU).